I’ve already told you about the fruit cake I make with friends each year from a recipe via my mother in law. It’s one of three I usually make each year, along with a dark fruit cake, and this one, the stained glass window cake. I first remember eating it as a child when Christine, a visiting friend of my parents, brought one with her. It was unlike anything I’d ever eaten, and of course seemed incredibly luxurious to us as children, being full of the sorts of fruit and nuts we ate only rarely. She gave us the recipe of course, but I don’t remember it being as regular a part of our Christmas tradition as the dark fruit cake, due mainly, I think, to the cost of the ingredients. As I’ve developed my own Christmas traditions, I’ve made it more often, particularly over the last few years because there are a couple of family members who can’t eat gluten and this cake, with only 115g of flour, is very easy to make gluten-free. I made the cake this year with half sorghum flour, and a quarter each rice flour and potato flour, but you could substitute any gluten-free flour you prefer. Even more than the other fruit cakes, this cake is absolutely dependent on the quality of the fruit and nuts you use as there is almost no actual cake, just the tiniest amount of batter to hold the fruit together. As I mentioned with the previous Christmas cake, I use Australian ingredients when I can, but unfortunately Australian glacé fruit is not available, at least as far as I can find. And the name? As you can probably guess, with so much glacé fruit, when you cut this cake thinly you can see the light shining through the slice! Heat oven to 150C, and grease and line tins with baking paper. This mixture will make two loaf pans, or two 20cm ring pans, or one round pan and a couple of baby ones if you want to give some away. 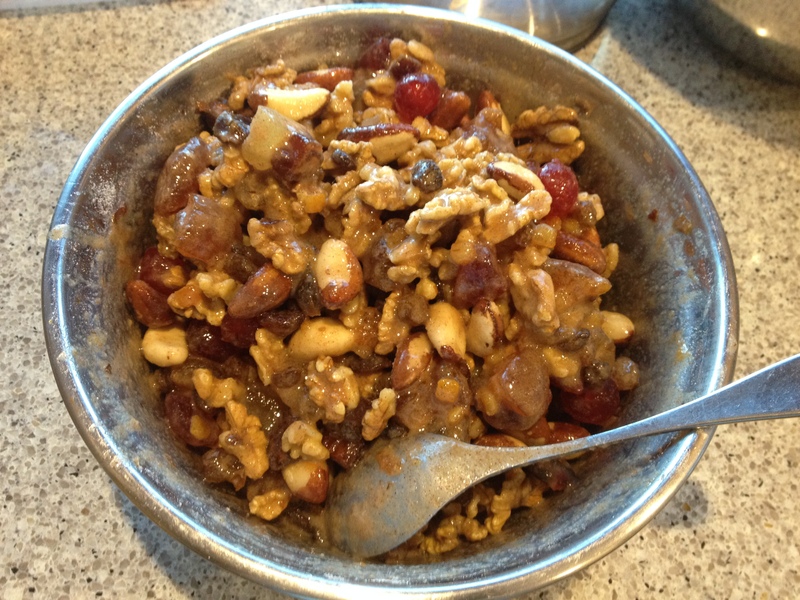 Chop glace fruit roughly and combine in a large bowl with all the other fruit and nuts. Toss through the flour, baking powder, salt and sugar. Whisk together the vanilla, brandy and eggs, and stir into the fruit and nuts. This will not look like a normal cake mixture – it’s basically a bowl of fruit and nuts coated with a thin batter. Just make sure there are no clumps of loose flour and that all the fruit is coated. 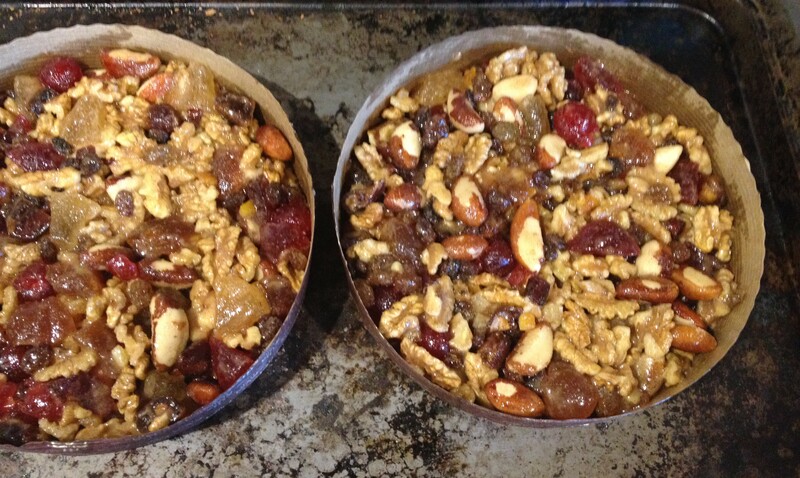 Scrape mixture into pans, pressing down very firmly and tapping the pan to ensure the fruit and nuts fill to the edges of the tin. Bake for about two hours (small cakes will be about an hour) until firm and the cake mix is cooked, though the fruit will still be very sticky. Cool in tin on a rack for about 10 min, then turn out, removing the paper immediately (or it will never come off!) and leave on the rack until completely cold. Mmmmm. It’s years since I made one of these! A lovely substitute for the gluten intolerant and, as you say, kaleidoscopically beautiful when thinly sliced and held up to the light! Your kitchen must be smelling divine at the moment. Yes 🙂 a euphoric combination of cinnamon, cloves, allspice, nutmeg and mace…. my boyfriend’s family makes a stained glass cookie that is very similar to this recipe, and it’s become one of my favourite christmas cookies. I can’t wait to try it in cake form; I bet it smells and looks incredible. Thanks Myriam – it is delicious :), the cookie sounds really interesting – is it like a Florentine?